Fosun boss Guo Guangchang is one of China’s most respected corporate leaders, a business guru to match former GE chief Jack Welch. His brief disappearance suggests no-one is safe from China’s graft crackdown. The heightened campaign, plus economic and currency worries, could worsen China’s capital flight problem. President Xi Jinping’s purge is escalating, and apparently widening focus after the stock market boom and bust. The number of institutions under investigation has quadrupled since he took power from 20 in 2013 to 83 in 2015, according the Eurasia Group. So far, the state sector has borne the brunt of the attack, with recent arrests at the securities regulator, CITIC Securities and Agricultural Bank among others. The private sector is now being drawn into the fight. The involvement of Guo, who heads China’s largest private sector conglomerate, sends a chilling signal to the country’s entrepreneur class about their safety. Earlier targets like hedge fund managers at Shanghai-based Zexi Investment or property executives at Ningbo Zhongbai could be dismissed as small fry operating in murky sectors. By contrast, Fosun is seen as well-run and has invested in many sectors, in China and around the world. To be sure, wealthy Chinese have been moving money abroad for years, snapping up property in the U.S. and Australia. Most have made their money in trade and are expert at moving money across borders or simply keeping their earnings in the markets where they sell their goods. China’s overseas investment drive presents another opportunity to move cash offshore. Yet the pace has stepped up recently. The market crash, plus worries about China’s weakening economy and currency, has sent money flowing out of the People’s Republic at unprecedented rates. November’s $87 billion drop in foreign exchange reserves was the biggest since August’s record monthly drop of $94 billion. The erosion of reserves doesn’t directly measure capital flight but gives an indication of the trend. The problems faced by Guo and his peers increase the motivation to put assets out of Beijing’s reach. The Hurun Report, which compiles a China rich list, estimates overseas investments only account for 16 percent of assets of wealthy Chinese. So there could be a lot more to come. 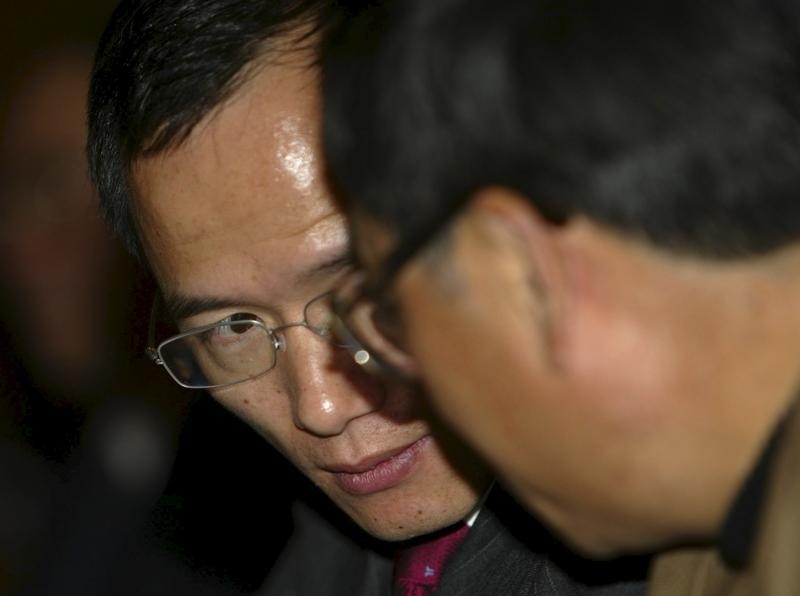 Guo Guangchang (L), Chairman of Fosun International, speaks with a man during a conference in Shanghai, China, in this December 26, 2004 file photo. Shares in firms controlled by one of China's best-known entrepreneurs were suspended in Hong Kong and the mainland after a financial magazine said the Fosun conglomerate had lost contact with billionaire founder and chairman Guo. The report by online publication Caixin late on December 10, 2015 quoted unidentified sources as saying Fosun Group had been unable to reach Guo since noon local time on Dec. 10. The self-styled student of investor Warren Buffett underlined his global ambitions earlier this year, closing a billion-dollar takeover of the Club Med resort chain. Picture taken December 26, 2004. China’s foreign exchange reserves dropped by $87.2 billion in November to $3.44 trillion in the third largest monthly drop on record, bringing the country’s reserves to their lowest level since 2013. Analysts partly blame the dollar’s rally during November which reduced the value of non-dollar reserves and partly China’s central bank selling dollars to support the yuan. Regulators have been trying to plug the holes in the country’s forex regime, tighening currency controls and cracking down on illegal transfers. Police arrested hundreds of people in November who were suspected of running an illegal underground banking network that transferred an estimated $125 billion out of the country, the Financial Times reported, citing the official China Daily newspaper. In a 2014 survey, the Hurun Report found 64 percent of wealthy Chinese have already emigrated or are planning to do so, with education, pollution and food safety driving the exodus.